Our license agreement with Kellogg's has expired and we decided not to renew it in order to license new cookbooks and bring you greater variety. Order now while you can! Cook'n with Kelloggs's has been discontinued. Kellogg's has been an American household brand for over a hundred years. This CD features over 2,200 Kellogg recipes and over 400 mouthwatering photos from the extensive Kellogg Co. archives. 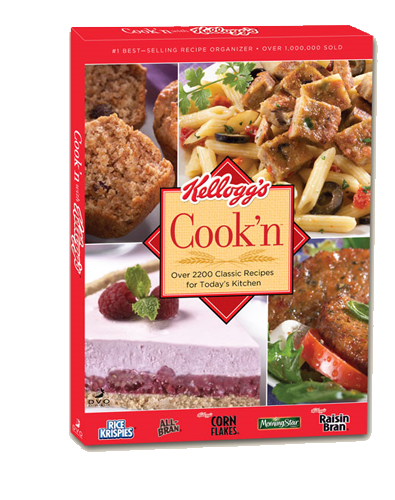 The Kellogg Recipe Book included on this CD includes great-tasting recipes for all occasions. Whether you�re looking for salads, appetizers, entr�es or desserts, you�ll find quick and easy recipes that are right for you. Just type in what you have on hand and Cook'n will search this tasty recipe collection in seconds and give you some delicious ideas for dinner! Adjust serving sizes with the click of your mouse. Make menus, shopping lists, and more! 2200 delicious recipes...plus photos and more! Just wanted to let you know that I LOVE my Cook'n Recipe Organizer software. I have been using it so much that I'm afraid I could never live without it now. I love the dove-tailing tips every week. My husband even remarked how much eaiser it is to do things ahead of time for meals later in the week when we are more rushed for time. I really enjoy watching the videos online that show how easy most of these recipes are!! I've even told my sisters how much I love it.